Inverters convert ac power to dc and then reshape that current to control ac motors. All types control speed by varying current frequency, but one subtype - flux vector inverters - uses current-switching techniques to control motor torque as well. In any induction motor, a portion of the current magnetizes or fluxes the motor, charging the rotor and magnetically coupling it to the stator. The remainder of the current actually generates torque. Unlike other frequency inverters, flux vector frequency inverters command both current components; flux current is held at the minimum required to induce a magnetic field, while torque-producing current pulsing through the stator is independently adjusted. Simultaneously controlling both torque and flux current is a mathematically intensive process. It requires continuous transformation between one coordinate system and another. During every sampling interval, the three-phase ac system - dependent on time and speed - must be transformed into a rotating two-coordinate system where every current is expressed and controlled as the sum of two vectors. Flux vector inverters can run with or without feedback. Open-loop types use motor data and current measurements to calculate rotor position. These calculations, usually performed by a digital signal processor, are accurate to within ±1.0% of base speed. Closed-loop vector inverters add encoder feedback to the equation, so the frequency inverter always knows the exact position of the rotor. This improves speed accuracy to about ±0.01% of base speed, and provides true infinite speed range, including full torque at zero speed. Where are flux vector inverters used? They're often used in winding applications. Web processes - from fine thread to heavy sheet metal - need tension control. Controls range from leather straps and weights to load cells and servomotors. In the middle of the spectrum are frequency inverters. Low-performance applications like scrap winders (with build ratios under 10:1 and lower line speeds) don't require accurate tension, so standard flux vector inverters can control this winding in simple torque-taper mode. The frequency inverter is programmed with high and low torque values (for full roll and core) and uses a speed signal to trim the torque reference. Unwinding is similar. Center-driven winding requires more sophisticated inverters, as speed and torque control must be coordinated as the roll builds or decreases in size. If motor speed range falls within 40:1 of base speed, a transducerless inverter generally suffices. Higher speed ranges require closed-loop configuration. Are there other types of inverters? Besides flux vector versions, there are simpler and less expensive V/F inverters. After converting ac line power to dc, V/F inverters use a pulse-width-modulation scheme to create an output roughly approximating a sine wave of variable frequency, with its amplitude, or voltage, proportional to set frequency. The speed range on V/F inverter is limited and torque is not easily controlled. How do inverters 'know' how a motor will use input current? 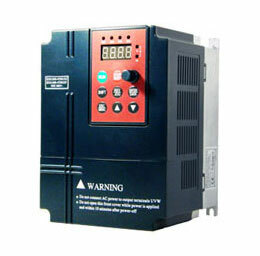 Adjustable or inverters are sensitive to changes in inertia, horsepower, motor lead length, and power quality. When they are first connected to a new motor, they need to be "told" what they're driving. This entails entering values for full-load amps, no-load amps, base speed, base frequency, motor voltage, and other parameters. Typically the frequency inverter also has a tuning procedure, during which it measures the response and electrical characteristics of the motor, saving this data in its memory.